Blacksmith Will Turner teams up with eccentric pirate Jack Sparrow to save his love, the governor's daughter. 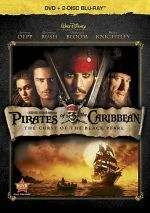 Before it debuted in 2003, Pirates of the Caribbean: The Curse of the Black Pearl looked like a probable flop. For one, a movie based on a theme park ride failed to prompt much optimism, and for another, pirate flicks hadn’t scored at the box office in decades. To the shock of many, Pearl became a massive hit, as with a gross of $305 million, it turned into one of the year’s true blockbusters. It wound up in third place for 2003, only behind Lord of the Rings: Return of the King and Finding Nemo. Nemo and Pearl both earned their gajillions the old fashioned way: via word of mouth. Neither leapt out of the box with remarkable openings, but both garnered strong crowds week after week. While their summertime competitors started big and faded quickly, these two kept things going consistently for long periods of time. Pearl opens with a flashback/dream sequence in which we meet young Elizabeth Swann (Lucinda Dryzek), the daughter of Port Royal Governor Swann (Jonathan Pryce). On their ship, they spy a raft on which a boy floats. They rescue him and she nabs a medallion from around his neck. We learn his identity as Will Turner (Dylan Smith), and her father puts Will in Elizabeth’s care. When a pirate ship appears and wheels to fire on them, Elizabeth wakes to reveal she’s now an adult (Keira Knightley), eight years after this event. She still has the medallion, and we also see that the earlier boat’s Captain Norrington (Jack Davenport) will soon gain a promotion to Commodore, and he clearly entertains romantic designs on Elizabeth. The adult Will (Orlando Bloom) feels the same. She still wears the medallion she lifted from him eight years earlier. Into Port Royal comes a pirate named Captain Jack Sparrow (Johnny Depp). He tells of the Black Pearl, a speedy ship manned by a “crew of the damned”. After Elizabeth falls into the sea during Norrington’s proposal, Jack saves her, but he soon runs afoul of the authorities. He threatens Elizabeth to gain his escape, but he gets captured again after a run-in with Will at the blacksmith shop where the young man works. While underwater, Elizabeth’s medallion sends out a deep tone, and this culminates in the arrival of the Black Pearl. Its crew attacks the town and goes after Elizabeth to snag the medallion. Captured by some goons, she demands to meet the Black Pearl’s leader, Captain Barbossa (Geoffrey Rush). She makes a deal to save Port Royal but gets stuck along for the ride. After Will busts out Sparrow to get him to help track Elizabeth, they commandeer a ship together and head out after her. From there, Pearl follows these basic quests but gets into many twists and turns along the way. When I heard Depp used Keith Richards as an inspiration, I didn’t realize how far he’d take this, as I thought Keef would simply influence Sparrow’s visual appearance. Instead, Depp whole embraces the indestructible Stones guitarist’s entire character and manner. This means Depp walks like Keith, talks like Keith, swaggers like Keith, and seems vaguely drunk much of the time. Okay, he’s more intelligible than the mumble-mouthed Richards, but he still presents similar vocal characteristics. Normally I wouldn’t like such a blatant imitation, but Depp manages to make it work. Depp narrowly avoids becoming too campy, and the same goes for the film itself. Pearl easily could have turned into a broad, silly spoof of the genre, but it manages to have its cake and eat it too. To be sure, the flick demonstrates full awareness of the genre’s clichés and winks at them. A few sly references to the Disney park attraction from which it drew inspiration appear, but not enough to become tiresome or annoying. Unlike something such as The Musketeer, Pearl doesn’t try to force itself into the 21st century via modern gimmicks that don’t match with the film’s style. You won’t find Hong Kong-style fighting, “bullet time” or hectic cutting here, as instead, director Gore Verbinski infuses the movie with a classic sense of swashbuckling and pays respect to its origins. That doesn’t mean Pearl comes across as bound to an earlier era, as Verbinski also manages to create something fresh and lively. Fun is the order of the day here, so despite the film’s slightly excessive length, it moves briskly and follows many twists and turns. Some of those probably should seem arbitrary and forced, but they all work. The flick moves from one element to another smoothly and logically, and it keeps us involved and entertained the whole way. From its briskly paced and inventive action sequences to its slightly campy but uniformly likable humor to its tight acting and good sense of genre, Curse of the Black Pearl presents a surprisingly delightful adventure. No wonder it reinvigorated a long dormant form of film. Pearl offers a very enjoyable experience. By the way, make sure you let the movie play through the conclusion of its end credits. An interesting capper occurs at that time that finishes the flick on a fun note. Pirates of the Caribbean: The Curse of the Black Pearl appears in an aspect ratio of approximately 2.35:1 on this Blu-ray Disc. Though not flawless, the image usually worked well. For the most part, sharpness seemed satisfying. Some wide shots demonstrated mild softness and looked a bit less defined than I’d like, mainly due to some mild edge haloes. Otherwise, the movie remained detailed and distinctive. No shimmering or jaggies appeared, and print flaws remained absent. Like most modern action films, Pearl leaned toward teal and orange. Within those constraints, the colors seemed clear and well-depicted. Given the atmosphere of the movie, blacks became more important, and the disc presented nicely rich and dense dark tones. A few instances of low light images were a bit thick, but most shadows seemed clear and accurately defined. In the end, this didn’t become a great image, but it held up well overall. By contrast, I found virtually nothing about which to complain in regard to the Uncompressed PCM 5.1 soundtrack of Pearl. The soundfield was wonderfully dynamic and involving, so the various channels presented a surfeit of information that blended together with great clarity and smoothness. All elements seemed placed accurately within the environment, and these components moved neatly across and between the speakers. This helped create a good sense of place and made the action all the more engrossing. Since Pearl included quite a few fight sequences, we got many opportunities for lively material. Cannonballs zoomed past us, gunfire blasted around us, and swords clanged from all sides. The surrounds played a vivid role in the proceedings and helped make this a decidedly immersive and impressive piece of work. I also found the audio quality to live up to high standards. Speech came across as firm and natural, and I noticed no edginess. Some lines became tough to understand, but that resulted from “pirate diction”, not due to poor recording. Music occasionally risked getting submerged beneath all the action, but the score remained bright and dynamic nonetheless, as the mix depicted these components vividly. Of course, the effects remained the stars of the show, and they appeared well displayed. The different elements sounded distinctive and clean, with no distortion or other issues. Dynamic range was excellent, and low-end seemed superb. Bass response always stayed tight and rich. Overall, I felt quite pleased with the audio of Pearl. How did the Blu-ray compare to the DVD version? The lossless audio showed a bit more range and depth, while visuals were tighter and better delineation. The Blu-ray delivered the expected step up in quality. The Blu-ray replicates most of the 2004 DVD’s extras, and that means it includes three audio commentaries. The first features director Gore Verbinski and actor Johnny Depp, both of whom sit together for this running, screen-specific piece. The pair prove chatty and reasonably engaging, though the commentary never rises to greatness. Most of the time they cover elements related to the rushed nature of the production. We hear of the relatively short period from inception to completion along with concerns connected to the work-in-progress script, technical elements, budgetary limitations, and other issues. We also get notes about the various actors and the challenges inherent in sea-based movies. Along the way, we find a fair amount of praise and backslapping, which becomes somewhat tedious. Depp doesn’t talk much about his performance, which seems like a disappointment. He discusses some other aspects of making the film like his nearly catastrophic injury but steers clear from subjects more closely connected to his work. Oddly, when the name “Keith Richards” appears toward the end of the film, it’s in a context essentially unrelated to Depp’s acting. The commentary doesn’t seem terrifically revealing, but it moves at a good pace and offers a generally useful examination of the flick. Next we hear from screenwriters Stuart Beattie, Ted Elliott, Terry Rossio and Jay Wolpert. Elliott and Rossio sit together for their parts, but the other two clearly appear solo. Wolpert barely says anything at all, as he plays a very minor role in the commentary. Beattie seems substantially more active. He gets into some aspects of the script, but he spends much of his time on a discussion of pirate facts and fiction. Though Beattie offers a fair amount of material, Elliott and Rossio clearly dominate the track. They go over the various drafts of the script, who did what, and variations between them. They also delves into stories from the set, as they continued to work on constant revisions to the text even during shooting. They provide some nice tales from that realm and offer a lot of interesting tidbits. Overall, the writers commentary proves to be entertaining and informative. The third track combines separate commentaries from producer Jerry Bruckheimer and actors Keita Knighley and Jack Davenport. Don’t expect much from Bruckheimer, as his part lasts a mere 13 minutes or so. I’ve heard many Bruckheimer interviews, and this one fits well with prior discussions. He provides some bland general remarks about the film and its participants, but you’ll learn little of value. Knightley and Davenport do the heavy lifting, so their side occupies about 77 minutes. Their track seems much livelier than the producer’s, and it proves to be a lot of fun. The pair interact with gusto as they run through topics that mostly relate to their experiences on the set. Davenport gets in more than a few remarks, but at times he finds it tough to overcome Knightley’s enthusiasm. She’s a regular force of nature as she rattles through different elements. Knightley talks about her on-and-off tan and hair woes plus many other cute bits. At times the pair do little more than narrate the on-screen action, but they manage to give us a fun and amusing examination of their work, so this piece merits a listen. New to the Blu-ray, Scoundrels of the Sea offers a branching feature. At times while the movie plays, you can select to leave the film and watch short featurettes. “Scoundrels” provides 34 of these in all. For those of us who don’t want to constantly interrupt the movie, we can view these via a separate menu. This lets you check out the clips individually or together through “Play All”, a collection that fills 51 minutes, 45 seconds. All of these snippets offer historical information about pirates. While I could live without the narrator’s bad attempt at a “pirate voice”, the facts themselves work well and give us a nice overview of all the lore. Disc One opens with ads for Invincible, The Guardian, The Prestige and Pirates of the Caribbean: At World’s End. Now we head to Disc Two, where we open with a 38-minute, nine-second documentary called An Epic At Sea: The Making of Pirates of the Caribbean: The Curse of the Black Pearl. We hear from director Gore Verbinski, producer Jerry Bruckheimer, executive producer Bruce Hendricks, set decorator Larry Dias, construction coordinator Robert A. Blackburn, screenwriters Ted Elliott and Terry Rossio, supervising art director Derek R. Hill, historical advisor Peter Twist, property master Charles M. Stewart, Lady Washington crewmember Brad Sousa, ILM physical model supervisor Charlie Bailey, costume designer Penny Rose, chief hairstylist Martin Samuel, makeup supervisor Ve Neill, sword master Bob Anderson, stunt coordinator George Marshall Ruge, visual effects supervisor John Knoll, stage production manager Mark Anderson, VFX director of photography Carl Miller, VFX art director Aaron McBride, CG model supervisor Geoff Campbell, cloth simulation supervisor James Tooley, ILM viewpaint lead, ILM animator Andrew Doucette, and actors Johnny Depp, Orlando Bloom, Geoffrey Rush, Keira Knightley, Orlando Bloom, Jonathan Pryce, Treva Etienne, and Jack Davenport. ”Epic” speeds through a number of general topics. We find information about the actors, locations and adaptations of those places, sets, integrating historical details, props, designing and utilizing different ships, costumes and makeup, sword fights and stunts, various special effects elements, and the movie’s premiere at Disneyland. Though none of these areas gets a lot of time, we receive a lot of useful notes about them and receive a nice overview of the subjects. I most enjoyed the look at makeup, especially in regard to the various uses of contact lenses. It also seems fun to see the Disneyland premiere, as I imagine that must have been a cool occasion. Overall, “Epic” provides a reasonably solid glimpse of the filmmaking process. Next we move to a series of Fly On the Set featurettes. These cover nine different movie scenes and fill a total of 35 minutes, 17 seconds via the “Play All” option. The featurettes present exactly what one might expect of them: video footage from the set free from interviews, movie clips, or narration. It’s straight material from the shoot as we watch rehearsals, collaborations and the actual filming. I love this sort of stuff, and “Fly” gives us a fun look behind the scenes. Three different elements appear in the “Diaries” domain. Producer’s Photo Diary fills four minutes, 18 seconds as we see Jerry Bruckheimer’s personal pictures from the set. He discusses his interest in photography and various elements of the production as we watch a montage of his snaps. Bruckheimer remains one of the dullest commentators ever known, but his photos provide some very good images from the set. He’s a talented photographer, so this section presents many fine pictures. In the nine-minute, 39-second Diary of a Pirate, we focus on the experiences of actor Lee Arenberg. He totes a video camera around the set, and this featurette includes the results along with some narration from Arenberg. We watch various aspects of his experience, from makeup to shooting different scenes to down time on the set. The commentary becomes a little cutesy at times, but “Pirate” nonetheless provides a fun glimpse of the production, especially since it comes from the perspective of one of the lower-billed actors. Finally, the 11-minute, three-second Diary of a Ship concentrates on the experiences of the Lady Washington, the ship used as the Interceptor. We follow it on its journey from California around western Mexico through the Panama Canal to its eventual arrival in the Caribbean. Mostly the program features video footage of this trip, but we also hear some comments from ship’s captain Brad Sousa. This provides a surprisingly compelling travelogue. For information on real pirates, we go Below Deck. This gives us mini-featurettes about many pirate-related topics. You can examine these either of two ways: through a tour of a ship, or as one continuous sequence. The latter seems much more user-friendly, so I went with it. Taken all together, these pieces run a total of 22 minutes, 13 seconds. We get various archival materials, movie clips and shots from the Pirates set plus interviews with maritime historian David Cordingly. We learn of the staff structure of pirate ships, battle procedures, notes about famous pirates, what the pirates stole and why, pirate symbols and ships, instances of buried treasure, and systems of punishment. This provides a quick but informative and entertaining examination of the facts behind the fiction. Note that the continuous version doesn’t provide all the available material. To see all of the short featurettes, you’ll need to either go through the ship tour or use the “Scene Index”. The latter seems to be the easiest way to examine the various topics. All of the extra bits function the same as those I mentioned earlier, as they provide comments from Cordingly and prove to be informative. Getting back to Pirates itself, we next find a short blooper reel. Mostly this three-minute, 10-second roll includes the usual assortment of goof-ups and silliness. However, some amusing improvs pop up as well, and those make it a slightly above average entry in the genre. A whopping 19 Deleted and Extended Scenes come up next, and this extensive collection fills 19 minutes, three seconds. These mainly embellish existing bits and flesh out some elements. None of them seem terribly important, and I don’t see any that should have stayed in the movie. Some entertaining snippets appear, however. After this we go to the ”Moonlight Serenade” Scene Progression. In this six-minute, 33-second clip, we watch as that sequence develops. It demonstrates various stages of the piece as we hear explanations from lead technical director Tom Fejes, CG sequence supervisors Russell Earl and Neil Herzinger, animation supervisor Hal Hickel, lead CG viewpainter Steve Walton, and cloth simulation supervisor James Tooley. The progression doesn’t follow a tremendously logical path, and it seems a bit disjointed. Despite that, it includes a lot of good information and helps educate us about the various elements that went into the scene’s creation. Within the Image Gallery, we find six subdomains. “Inspiration” presents 13 pieces of pirate images used to stimulate ideas. “Concept Art” includes 47 elements, most of which depict skeletal pirates. Four scenes of “Storyboards” appear with “Blacksmith Shop” (48 drawings), “Black Pearl vs. Interceptor” (33), “Dauntless Capture” (58), and “Captain Jack Sparrow” (41). “Costumes” features 14 shots that mix sketches and photos of actors in finished wardrobe. “Production” includes 30 pictures from the set and the flick. Lastly, “Publicity” shows five posters. These come via “slideshows” which make them a little more awkward to access than the usual stillframe access or the preferred method of thumbnails. Nonetheless, some nice material appears here. Walt Disney’s Wonderful World of Color gives us an 18-minute, 19-second segment from a January 21, 1968 broadcast of that series that concentrates on the creation of the Disneyland “Pirates of the Caribbean” attraction. This includes some clips from the Disneyland 10th anniversary episode featured in the Disneyland USA package. It then goes into detail about the technology behind Pirates as well as images from the attraction’s creation and shots of the park and the ride’s opening day. We also take a pretty extensive tour of the completed attraction itself. Since Walt died before this show aired, he goes missed, but “Color” offers a cute glimpse of history nonetheless. 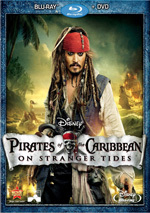 The following features were originally exclusive to the 2004 DVD, and the first two focus on lead actors: Becoming Captain Jack (7:19) and Becoming Barbossa (5:31). The first includes information from Depp, Bruckheimer, Verbinski, and Rush, while the second presents remarks from Rush, Depp, and Verbinkski. Both look into character issues, influences, and what the actors wanted to do with the roles. “Jack” feels somewhat tedious - how many times do we have to hear about the Keith Richards references? - but “Barbossa” proves moderately illuminating. Good shots from the set pop up in both, so even when the information lacks much depth, they present some intriguing elements. After this we look practical effects via Thar She Blows!, a six-minute, 17-second program that shows the construction and destruction of the Interceptor. It includes statements from Charlie Bailey, chief architect Peter Bailey, Mark Anderson, John Knoll, Carl Miller, pyrotechnician Geoff Heron, and chief ship carpenter Robbie Edwards. We check out the design elements of the ship, the building of the miniature, shooting it on the water, and ruining it. The piece places its emphasis on behind the scenes details. It gives us a nice look at the work that went into this element, and it proves quite useful. Another featurette called The Monkey’s Name Is Jack runs four minutes, 35 seconds. It includes information from animal trainer Ursula Brauner, Geoffrey Rush, Johnny Depp, Keira Knightley, Jerry Bruckheimer, and Gore Verbinski. As one might expect, this show focuses on the movie’s monkey actor. We learn the methods used to get the monkey to act as well as various challenges. A little fluff shows up, but the program usually adds fun and educational notes. Since he spends the most time with the monkey, Rush offers the best notes about his experiences. In Pirates Around the World, we get a multilanguage comparison. The four-minute, 11-second clip examines portions of the film with snippets in French Canadian, Thai, Castilian, Russian, Portuguese, Italian, Latin Spanish, German, French, and Japanese. We often find this sort of feature on Disney’s animated releases, but it’s unusual to see one with a live-action flick. It’s cute but nothing special. For Spirit of the Ride, we take seven minutes, 11 seconds to compare the movie with the theme park attraction. We get notes from Elliot, Rossio, Depp, Verbinski, Bruckheimer, and Knoll. The participants offer some memories of their reactions to the ride and we get a few remarks about efforts to recapture its feel. We also watch some examples of the ways the movie echoes the attraction. The piece sounds better in theory than in execution, but it provides a reasonably concise exploration of its subject and it points out some elements we might otherwise miss. An animatic shows up next. Entitled “Sneak Attack”, it lasts four minutes, 16 seconds. This presents a crude computer-animated previsualization of the scene in question. It’s a decent look at this form of high-tech planning technique. With Dead Men Tell No Tales, we get a 13-minute, 55-second look at the creation of the “Pirates” ride via archival materials and interviews with project director Bruce Gordon, Imagineering vice chairman Marty Sklar, senior vice president Tony Baxter, senior show writer Chris Goosman, executive vice president Tom Fitzgerald, and Imagineers Alice Davis, Harriet Burns, Blaine Gibson, Wayne Jackson, Francis X. Atencio, and Roger Broggie. The program goes through the attraction’s genesis and completion and provides an entertaining and enjoyable tour. A third disc provides a DVD copy of Pearl. It replicates DVD One from the original release. Probably 2003’s most pleasant cinematic surprise, Pirates of the Caribbean: The Curse of the Black Pearl ably overcomes the cheesiness of its origins and provides a deft and lively adventure. It reignites the fun of pirate flicks and still manages to feel fresh and invigorating. The Blu-ray brings us good picture as well as excellent audio and an extensive set of supplements. Curse remains a fun film and the Blu-ray brings it home well.